PLEASE NOTE: ALL ATTENDEES MUST REGISTER FOR THIS EVENT. THERE ARE 5 DIFFERENT APPOINTMENT TIMES AVAILABLE WHEN REGISTERING. SANTA’S TIME IS PRECIOUS AND LIMITED! CLICK THE GREEN “REGISTER” BUTTON TO GET YOUR TICKETS. Yes, each event has limited spacing. Please make sure to order a ticket for each person attending. Each event will last about 45 minutes. What if I have ordered tickets and know that I cannot attend or would like to change my time? 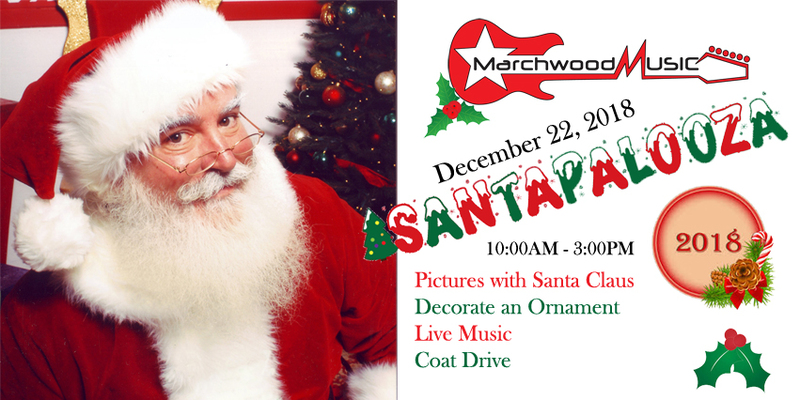 Please contact Marchwood Music @ 610-363-6520 and let us know. Do I need to donate a coat? No, this event does not require a donation to attend.